Amazon ECS now includes integrated service discovery. 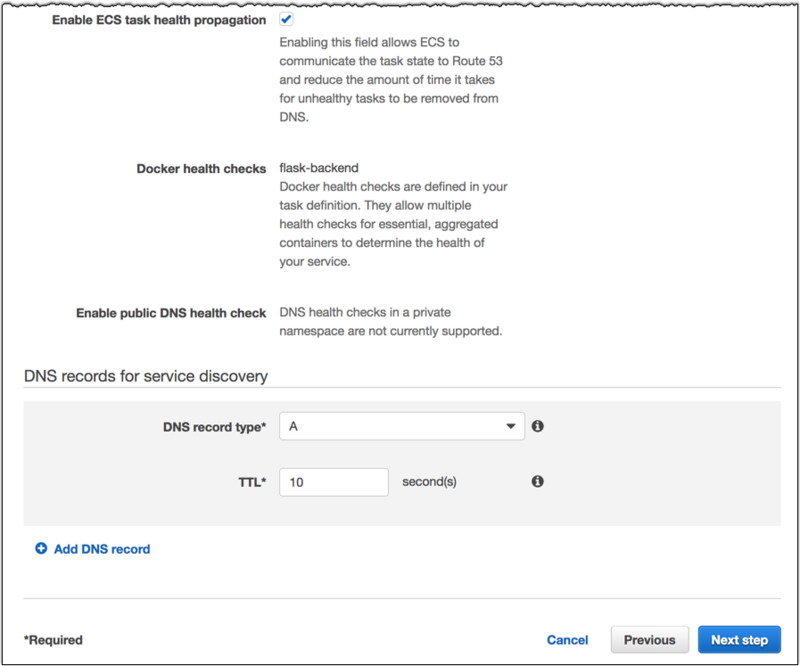 This makes it possible for an ECS service to automatically register itself with a predictable and friendly DNS name in Amazon Route 53. As your services scale up or down in response to load or container health, the Route 53 hosted zone is kept up to date, allowing other services to lookup where they need to make connections based on the state of each service. You can see a demo of service discovery in an imaginary social networking app over at: https://servicediscovery.ranman.com/. Part of the transition to microservices and modern architectures involves having dynamic, autoscaling, and robust services that can respond quickly to failures and changing loads. Your services probably have complex dependency graphs of services they rely on and services they provide. A modern architectural best practice is to loosely couple these services by allowing them to specify their own dependencies, but this can be complicated in dynamic environments as your individual services are forced to find their own connection points. Traditional approaches to service discovery like consul, etcd, or zookeeper all solve this problem well, but they require provisioning and maintaining additional infrastructure or installation of agents in your containers or on your instances. 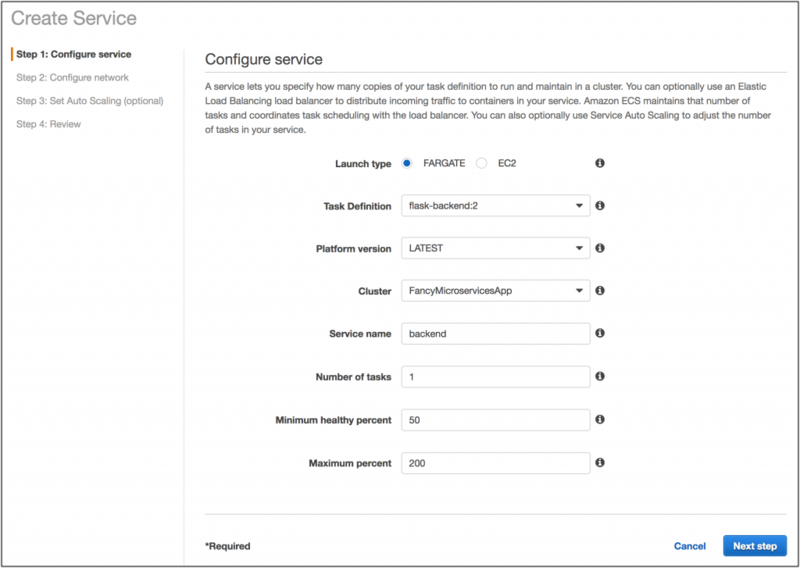 Previously, to ensure that services were able to discover and connect with each other, you had to configure and run your own service discovery system or connect every service to a load balancer. Now, you can enable service discovery for your containerized services in the ECS console, AWS CLI, or using the ECS API. Namespaces – A namespace specifies a domain name you want to route traffic to (e.g. internal, local, corp). You can think of it as a logical boundary between which services should be able to discover each other. 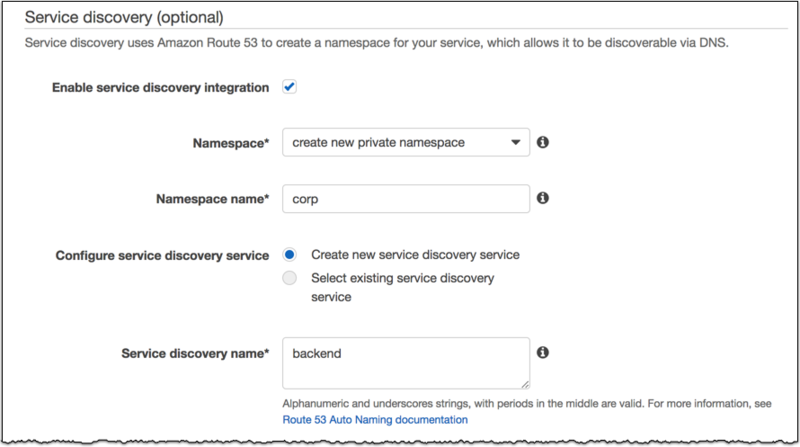 You can create a namespace with a call to the aws servicediscovery create-private-dns-namespace command or in the ECS console. Namespaces are roughly equivalent to hosted zones in Route 53. A namespace contains services, our next vocabulary word. Service – A service is a specific application or set of applications in your namespace like “auth”, “timeline”, or “worker”. A service contains service instances. Service Instance – A service instance contains information about how Route 53 should respond to DNS queries for a resource. Route 53 provides APIs to create: namespaces, A records per task IP, and SRV records per task IP + port. When we ask Route 53 for something like: worker.corp we should get back a set of possible IPs that could fulfill that request. If the application we’re connecting to exposes dynamic ports then the calling application can easily query the SRV record to get more information. ECS service discovery is built on top of the Route 53 APIs and manages all of the underlying API calls for you. 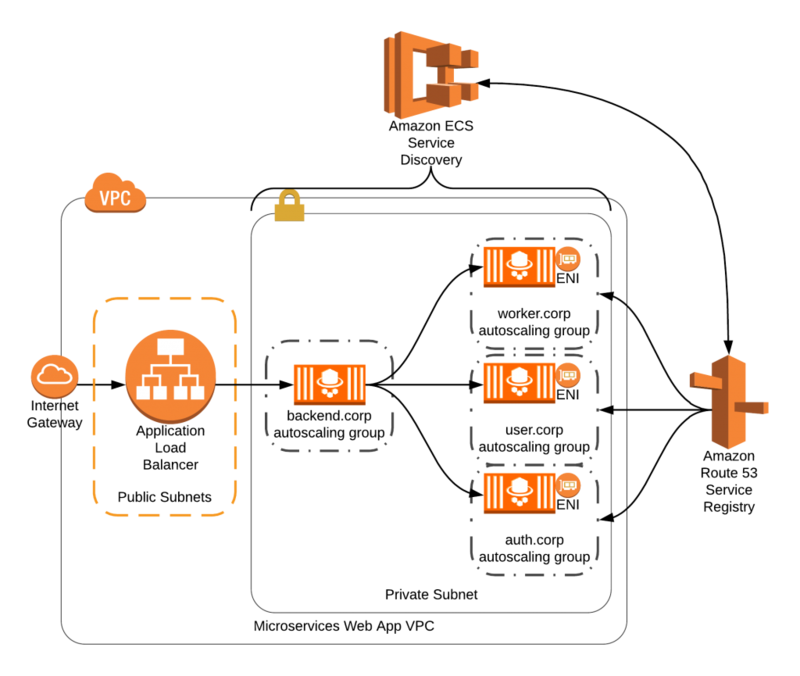 Now that we understand how the service registry, works lets take a look at the ECS side to see service discovery in action. Now, with my containers and task definitions in place, I’ll create a service in the console. As I move to step two in the service wizard I’ll fill out the service discovery section and have ECS create a new namespace for me. I’ll also tell ECS to monitor the health of the tasks in my service and add or remove them from Route 53 as needed. Then I’ll set a TTL of 10 seconds on the A records we’ll use. I’ll repeat those same steps for my “worker” service and after a minute or so most of my tasks should be up and running. Over in the Route 53 console I can see all the records for my tasks! We can use the Route 53 service discovery APIs to list all of our available services and tasks and programmatically reach out to each one. We could easily extend to any number of services past just backend and worker. I’ve created a simple demo of an imaginary social network with services like “auth”, “feed”, “timeline”, “worker”, “user” and more here: https://servicediscovery.ranman.com/. You can see the code used to run that page on github. Amazon ECS service discovery is available now in US East (N. Virginia), US East (Ohio), US West (Oregon), and EU (Ireland). AWS Fargate is currently only available in US East (N. Virginia). When you use ECS service discovery, you pay for the Route 53 resources that you consume, including each namespace that you create, and for the lookup queries your services make. Container level health checks are provided at no cost. For more information on pricing check out the documentation. Please let us know what you’ll be building or refactoring with service discovery either in the comments or on Twitter! P.S. Every blog post I write is made with a tremendous amount of help from numerous AWS colleagues. To everyone that helped build service discovery across all of our teams – thank you :)!